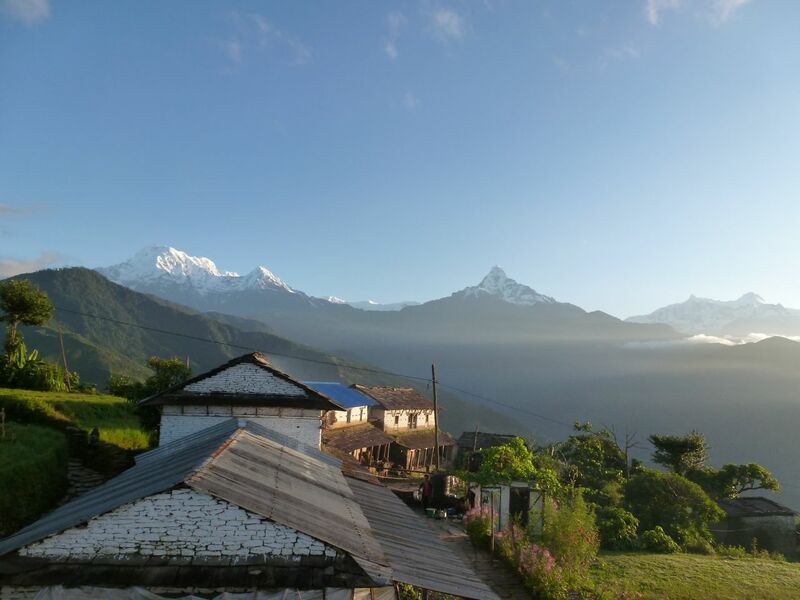 When I was studying abroad, I lived with a Sherpa family in the hilly region of Nepal for about a month. It was an amazing experience that introduced me to a side of Nepal very different from Kathmandu, the side I was used to. One of the best parts about living in the village was getting to know my host sister who was both patient and continually willing to teach me about her culture and life. 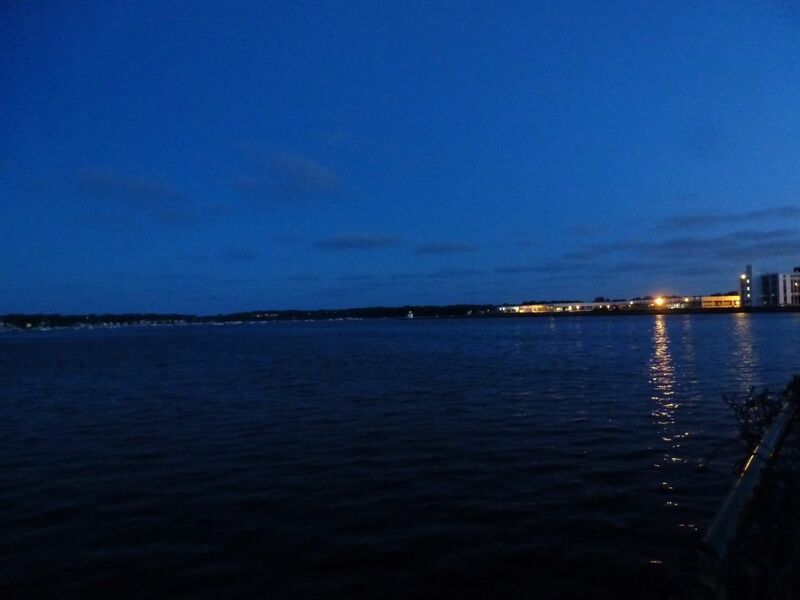 Although her village felt very remote at the time, I eventually learned that it had surprising connections to my own home. My second day in the village, I went to help my Sherpa sister in her fields. She gave me a scythe, and we started cutting millet. Her cutting was quick and seamless, mine clumsy and labored. But as the sun spread through the valley in the early morning, I gained a bit of confidence and settled into the meditative field work. Maybe I was too confident because within a few minutes, the scythe had slipped and it’s sharp blade dug deep into my finger. I looked down in horror at the white gash turning to red, but my didi reassured me. “Don’t worry. Come over here, quick,” she said to me in Nepali as she motioned for me to follow her through the waist-high stalks of millet. Once we reached the hillside, she dug through the brush until she had found a thin, red vine with leaves flanking both sides. She stripped the leaves off in one sweep, rolled them between her hands, and squeezed the green juice into the gash on my finger. I had never used leaves to heal a cut before, so that night I looked at the wound skeptically. The next morning, however, the broken skin had almost completely closed. As I continued to live with my host sister for that rest of that month, I learned about her use of all sorts of plants for religious purposes, as medicine, and, of course, for food. Fast forward about eight months: I was in North Carolina at the beach, and we went kayaking to one of the small islands off the coast. As we were trudging along the island, scanning the trees for wild horses, I looked down at the dry, sandy ground. There, nestled in it’s green, leafy shell was that little orange fruit, the same type that I had seen in my didi‘s village the year before. I picked up the nearly trampled specimen and inspected it carefully in disbelief. Both the US and Nepal grow some of the same well-known fruit (bananas, apples, oranges, etc. ), but it seemed unbelievable to me to find this obscure berry on both the islands of North Carolina and in a remote village in the Himalayas. After a quick search on the Internet, I found out that the plant is called a ground cherry, a relative of the tomato. I also learned that the tomato and related plants, which are native to the Western Hemisphere, didn’t reach Europe and Asia until explorers brought them over. The ground cherry couldn’t have been part of Nepal’s landscape for more than a few hundred years. As I learned about the voyage of the tomato and its relatives from the new world to the old, I wondered in amazement at how intricately connected our world is. I always thought of globalization as a modern thing, something of the 20th century. Plane travel and increased migration opportunities may have sped up the process, but its been happening for much longer than the last hundred years. Nepal used to seem like such a far away place. The village seemed especially far with no internet access and my allotted one-call-per-week back to the US. But there’s been trade and connection between the East and the West for a long time. The migration of the ground cherry and tomato from its origins in the Americas to the rest of the world may seem like a small blip in the history of things, but it’s a reminder that people have been traveling, sharing ideas, crops, and food probably for as long as we’ve been around. It also raises a whole bunch of questions. Tomatoes are a part of the Nepali cuisine, but they’re not necessarily a main feature. Consider the chili pepper, though, which is another imported plant and an integral part of the Nepali and South Asian diet. What did South Asians eat for spice before chili peppers? Was spicy food as big a part of Nepali cuisine before they used the chili pepper in their cooking? And where did all of the Nepali names for these foods come from? golbedha (tomato), aloo (potato), khorsani (hot pepper). Are they loan words? Did they arise within the Nepali community? Today is our 1 year anniversary! I can’t believe it’s been a year already. One year ago in June…Tri’s mom had recently passed away, and we were all deep in grief. After she died, Tri immediately left for Nepal to participate in the mourning process but was back by June with a plan to return to Nepal. I had just graduated from college and was so happy to have Tri back with me in the US. We were both getting ready to leave for Nepal, but we had to get married before we left. (this post explains what happened that spring and why we married young). The day we got married I returned home to my parents’ house from our apartment and tried to help my mom get things ready. A few hours before the ceremony, I picked out an outfit. My mom got some flower arrangements from the local flower shop. And Tri showed up from work in the late afternoon. Before everything started, a few close family and friends came over to be with us and we set up a skype call with my older brother so that he could watch the ceremony from Boston. Tri and I stood up with the officiant, our family friend. The minute I got up there, I started to get nervous. It’s funny because we’d been together for over three years at that point and had been certain since almost the beginning that we wanted to get married, but somehow, I was still shaking at the alter. I wasn’t nervous about getting married to Tri, but I recognized it as one of those moments I’ll remember for the rest of my life. The significance of that made me jittery. Our officiant asked the important questions, we said yes, and I felt a great sense of relief. After the ceremony, we called Tri’s dad in Nepal. It was a sad phone call; we told him we were married, and we all cried a bit. It was difficult not to have either of Tri’s parents there with us. Then we all sat down to a big dinner and homemade cake. Despite the grief that Tri and I felt, it was still a beautiful day and a time of celebration. We haven’t given up on having a bigger wedding, though, and right now we’re looking at dates in Spring of 2014. I know it seems far away, but I really want to get it right this time. I want to take time to plan it out and make it possible to have a big celebration with our friends and family. I have worried about whether or not we did things right, especially because we breached tradition in both cultures. Even before the wedding, we didn’t really “get engaged.” Tri never got down on one knee or gave me an engagement ring. We just kind of decided together that we wanted to get married. And then the whole thing with having multiple weddings…Is it strange to get legally married first and have our wedding later? Which date will we celebrate our anniversary on? But I’ve come to peace with the fact that we haven’t done it the traditional way. Talking to others who haven’t followed tradition has also illuminated the fact that it’s okay. People do things differently and it all works out. The most important thing is that Tri and I get to be together and that we’re happy. After a year of marriage, I can definitely say that we are. The sublet we’re living in right now is mostly empty. We’ve got a bed and some side tables, but the girl living here before us took the dining table and couch with her, so we’ve been on the lookout for new furniture. The other night while we were walking around the city we happened upon a sturdy looking coffee table that someone had thrown, legs up, into a dumpster. We quickly checked it over for any damage or stains to see why someone might have thrown it away, but we couldn’t find anything, so we hauled it back to our apartment. When I told my brother about our find on the phone, he warned me in a grave tone, “Zoe, you’d better be careful. Your neighborhood is notorious for bedbugs.” Oh dear. I checked over the coffee table carefully once more, but I couldn’t find anything, and we haven’t had any bites yet. Fingers crossed. Anyway, I think bed bugs are more common in things made with cloth, like matreses and couches, so we’re probably safe for now. About two weeks into my homestay in Nepal, I started to get an itchy rash on my upper chest and back. I thought it was an allergic rash of some sort, so I popped a few allergy pills and tried to ignore it. A few days later, my host mom started to notice it too. She told me it was probably a heat rash and doused me in prickly heat powder. But as the clouds of powder settled, and my itchy skin just kept itching, it started to dawn on me that something else was going on. When I first heard the term, I didn’t actually know what they were, but it certainly sounded sinister, like some awful hybrid of scabs and rabies. After she told me that, I was starting to freak out a bit, but I was still holding out hope that somehow it wasn’t what it looked like. “Okay,” I thought, “I can do this.” I went to the pharmacy, got some medicine, and then the intern and I left to go home on the bus. She got off at her stop, and I kept going until I got to mine. When I got into my room, and looked more closely at the medicine, I quickly realized that my idea of what he meant by lotion was far different from what came in the little bottle. I had imagined some kind of flowery-smelling spot treatment that I would apply in dabs. In actuality it was a chemical-infused pink goop that I had to smear thoroughly on my skin from neck to toe. So much for clean PJ’s and sheets. The next day I skipped class to pour boiling water on my clothing, to ensure that all of the mites were killed. I remember hauling piles of my clothing down onto my host family’s front yard while curious neighbors stared unabashedly, probably mystified by my behavior. Later that week, we left for one of our study trips to Chitwan and Pokhara. I took only what I needed and quarantined the rest of my clothing in my room. I locked the door to make sure no one would come in contact with the infested clothing and hoped that the mites left over would die while we were gone (which they did). I had to use the boiling water trick a few more times on the clothing I brought with me, but slowly the itching and red bumps subsided. Getting scabies was definitely one of my low points while studying abroad, but I got over it. Besides, it really does make me appreciate the fact that at least, for now, there aren’t any mites burrowing under my skin or bugs crawling in my bed. 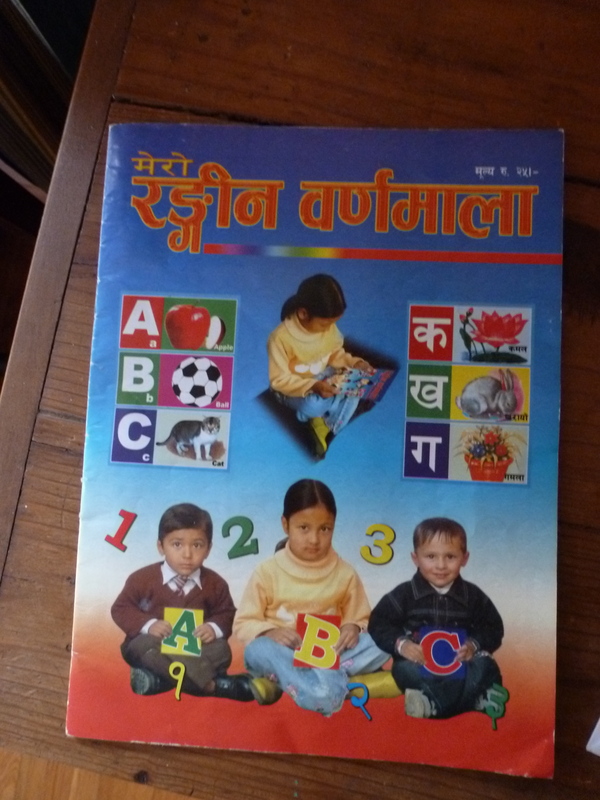 When Tri’s parents came to the US for his college graduation in 2009, they brought me a little kid’s book used for learning first letters in Devanagari (the script used to write Nepali, Hindi, and other South Asian languages). Tri worked through some of the activities in that book with me, and I did learn how to spell my name in Devanagari, but I really didn’t soak in much. When I was studying abroad, we were supposed to learn Devanagari along with our Nepali language lessons. I put in effort at first; I wrote my characters slowly but diligently, but after a few lessons, I quickly fell irritated with it. Unlike Nepali language, which I loved going to class for, I just couldn’t motivate myself to really learn Devanagari. And honestly, I think trying to learn Devanagari brought back some memories of learning to read and write as a kid, two things I really struggled with. Eventually, I came to love both, but those memories of struggle haunted me while I was tracing those unfamiliar characters. As time passed in Nepal, I came to realize that it was important for me to know at least some Devanagari, especially when I was more on my own during my independent study project. It was useful when reading signs and trying to navigate areas in the city. Despite Devanagari’s uniformity, I’ve never been fully motivated to learn to read and write Nepali, and I think the main reason doesn’t actually have to do with the writing system but instead has to do with the way that written Nepali works. When we were still in Nepal, Tri got a section of the newspaper out that featured a kid’s story about a lizard and a squirrel. In an attempt to encourage me to practice my Devanagari reading skills, he gave it to me, but it was no use. The major problem I run into with written Nepali is that it’s so different from spoken Nepali. For starters, the verb conjugation in written Nepali is very different from spoken Nepali. I guess that spoken Nepali has gravitated away from written Nepali. I don’t know the history of it, but it’s really confusing! In addition, many of the words in written Nepali are words I’ve never once heard before in spoken Nepali. It makes reading very slow and difficult. It’s frustrating to try and decipher something written for beginner readers and have to ask Tri about almost every other word. A few paragraphs after starting that little article about the lizard and chipmunk, I got fed up and stuffed it into a drawer. Clearly not the right attitude to take when learning something new. Will I ever need to know how to read and write in Nepali? Probably not. But it would definitely be nice! and could open up a whole new world of books, newspapers, and magazines. Recently I’ve been reading more of Zen Habits, a neat blog my dad introduced me to a few years ago. Leo Babauta, the author there, has recently written about ways to cultivate habits. One thing he suggests is doing something that you want to turn into a habit for just 1 to 2 minutes a day. Once you’ve done that for a month or more, you can bump up the time. Maybe I can try to practice my Devanagari for just a few minutes every day for a month. It may not get me far, but if I can make it a habit and turn it into something that I look forward to doing every day, then at least maybe I’ll be on the right track.